Todays Duck Camp update unexpectedly isn't about ducks! Instead I had to write a few brief words about my amazing family pet and part time retriever Onyx. 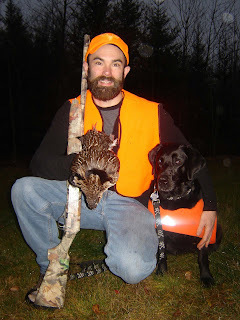 Today marked her very first retrieval of a Ruffed Grouse. After our morning hunts Onyx and I had been trying to get some additional exercise by walking the logging roads in pursuit of this fine game bird. Despite Onyx's best efforts to flush birds (including Grouse and Woodcock) I just wasn't able to be quick enough or accurate enough to take a good wing shot. As luck would have it on the drive home (what we around here call "heatah huntin") a grouse ran across the road and stood there about 10 yards into the woods looking at us. Well never one to look a gift horse in the mouth, I jumped out of the truck and gave him a lethal dose of #8s from my Franchi 612. Onyx was then released and via her nose searched, found and returned the bird. Man, talk about your proud Papa! Congrats Onyx you the Dog! hey Rabid explain "Heatah Huntin".I'm interested in what that means exactly. T and I used to go Heatah Huntin in between classes in college. That's actually the only way I've been bird (partridge, specifically) hunting. I absolutely love your dog. She looks like the dog my grandparents used to have. Labs are the best (except the mean one next door to me :(. Explanation of "Heatah Huntin" is actually going to have its own separate blog posting. My brother and I invested many hours to this ancient and primitive form of hunting this past weekend as we attempted to drown our sorrows in missing a day chasing Eiders on the Atlantic due to boat "issues" . . . stay tuned! Yeah, she is far from perfection but every so often she amazes me! Jodi, in between classes? I always had to go AFTER classes due to the extracurricular nature of "heatah huntin" . . . :) Mean lab . . . never! Maybe our "heatah" hunting is different than yours down south. The accent and all, things can get lost in translation. ;-) We both had a couple days a week with early AM class and then late PM class, so a good part of the day was free. And, I swear, mean lab. He used to charge us - though thankfully, they've gotten him broken of that habit now that we have Monkey running around outdoors.